WRTH 2018 has been published and is available to order from www.wrth.com or your usual supplier. Orders direct to our website will usually be dispatched the same day, or the first business day after (if ordering at the weekend or after business hours). Other publications or internet resources may give you the broadcast schedules – but that is about it. We give you the schedules and so much more. We have full contact details for each station; Station Identifications, as used on air; opening and closing melodies; transmitter details; verification methods and more. Add to that reviews of receivers, antennas and radio related accessories; articles from around the world capturing some of the little known services as well as the big, international broadcasters. Visit the website for the full story, sample pages and details of other products we offer. Click here to visit WRTH online. This entry was posted in AM, Broadcasters, News, Schedules and Frequencies, Shortwave Radio and tagged International Radio for Disaster Reduction Schedule, Shortwave Radio, World Radio TV Handbook, WRTH, WRTH 2018 on December 10, 2017 by Thomas. I just brought home my copy of WRTH 2016 from the post office. I didn’t expect it to arrive so soon from the UK, so I’m very much looking forward to reading through it over the next few days. It’s a special volume, too: WRTH’s 70th anniversary edition! I’m also honored to have a feature article and two reviews in this particular edition. You can order your copy from Amazon or Universal Radio here in the US, from Radio HF in Canada. Otherwise, consider ordering directly from WRTH online. I’ll post an overview of WRTH 2016 in the coming days. This entry was posted in Books, Broadcasters, New Products, News, Shortwave Radio and tagged World Radio TV Handbook, WRTH, WRTH 2016 on December 24, 2015 by Thomas. We are delighted to announce the publication today of the 70th edition of WRTH. For full details of WRTH 2016 and to order a copy please visit our website at www.wrth.com where you can also order the B15 WRTH Bargraph Frequency Guide on CD and as a download. WRTH 2016 is also available for pre-order, for readers in the USA, from Amazon or Universal Radio in Ohio. 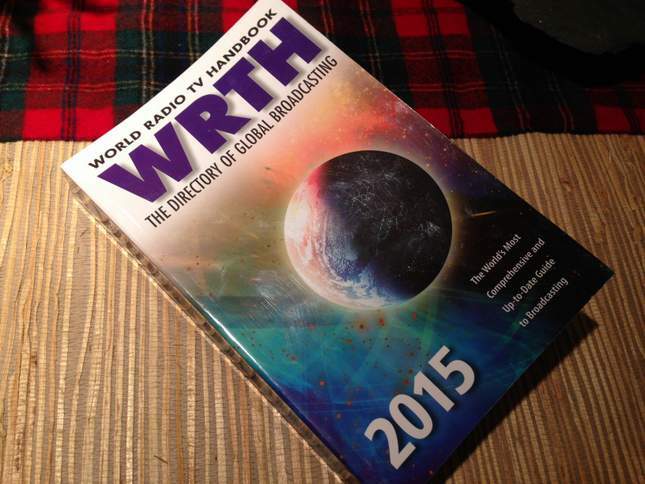 This entry was posted in Broadcasters, Mediumwave, News, Schedules and Frequencies, Shortwave Radio and tagged 2016 WRTH, World Radio TV Handbook, WRTH, WRTH 2016 on December 11, 2015 by Thomas. This entry was posted in Broadcasters, Mediumwave, News, Schedules and Frequencies, Shortwave Radio, What's On Shortwave and tagged A15, Sean Gilbert, World Radio TV Handbook, WRTH on June 27, 2015 by Thomas.